My name is Linda and I work in the Chandlery at Tooley’s Boatyard. That is me in the leather, looking as though I am propping up the bar. I was out on the maiden cruise of the restored “Icebreaker – Oxford 1” going through Banbury lock which is just beyond the boatyard. 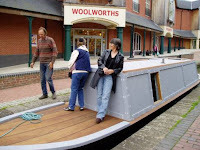 I moved up to Banbury from Brighton in 2003, although I have been cruising the Inland Waterways since 1984. Our first boat was a 16Ft fibreglass boat that we had brought up from Littlehampton, Sussex and launched onto the Grand Union at Southall. Our mooring was at the BWB yard at the top of the Hanwell Locks. We had many happy holidays on this boat with our four children and dog. Our next boat was a “Microplus” which we moored at Marsworth. This was a lovely mooring on the Grand Union above the Tring reservoirs. Our current boat is (or was) a Clubline “Mulberry”. It was a 20ft steel boat which was outboard powered. This has now been stretched to 42Ft and is powered by an “Enfield” twin opposed inboard. We even have a pointy end!!!! 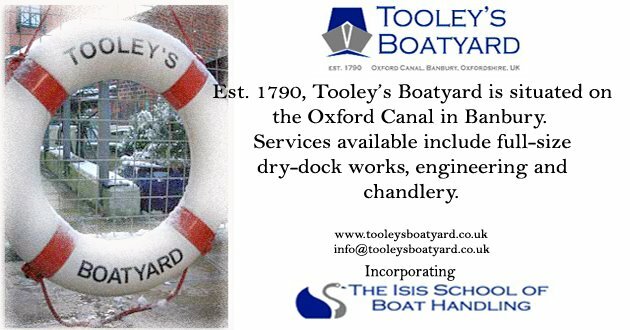 I have met many interesting people since working at Tooley’s, as the historic boatyard was used by a lot of the old working boat families and has a 200 year-old working Forge, which attracts a lot of visitors. Hopefully you will come in and visit us.